Cedar Park is the new musical project from Toronto's Dylan White. For the recording of his forthcoming debut album, Way Back Home, he tapped an impressive list of guest musicians, and one of my personal favorites, Emm Gryner, to produce. The highlight of the record is undoubtedly the impressive "Think So Now". The horn-powered song boasts the booming vocals of esthero, combining to make an extremely forceful song. Despite that, Cedar Park is at it's best though when there's a rootsier, rockier element to the music. NQ Arbuckle's vocals on "What She Tells Me" make for a catchy country rocker. Chris Adeney (aka Wax Mannequin) chips in on the album closer "Let's Make the World Go Round", providing a Springsteen-esque gravitas. Not everything works though. Sometimes the tunes are a little too polished and a little too sterile. Smashing Pumpkin James Iha contributes to the slow, sappy "I Just Happen To Know", a track that seems to try too hard. "Believe Me", featuring Canadian Idol's Kalan Porter, is pure schmaltz. A good balance is struck with "Over My Head". Seamless intertwining vocals with Usra Leedham really bring out the strong sense of harmony while placing the focus squarely on the songwriting. Despite some ups and downs, there is a lot here to make one hopeful. 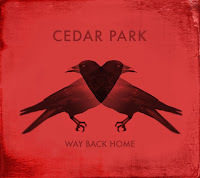 Whether you love to entire album or not, there's no doubt that we will be hearing a lot more from Cedar Park in the future. Best tracks: "Think So Now", "What She Tells Me"